Getting the natural photo with a beautiful butterfly can be a difficult task for any photographer. You can’t catch the motion, the butterfly appears blurred or in the wrong place on you shot. You and your customers will be satisfied when you understand how easy it is to get that perfect shot that you are aiming for with our beautiful Photoshop butterfly overlays. Our set of free butterfly overlays for Photoshop with bright, multicolored, and beautiful butterflies of any size is ideal for different types of photo shoots outdoors. You can use butterfly overlays Photoshop anywhere and as you want! 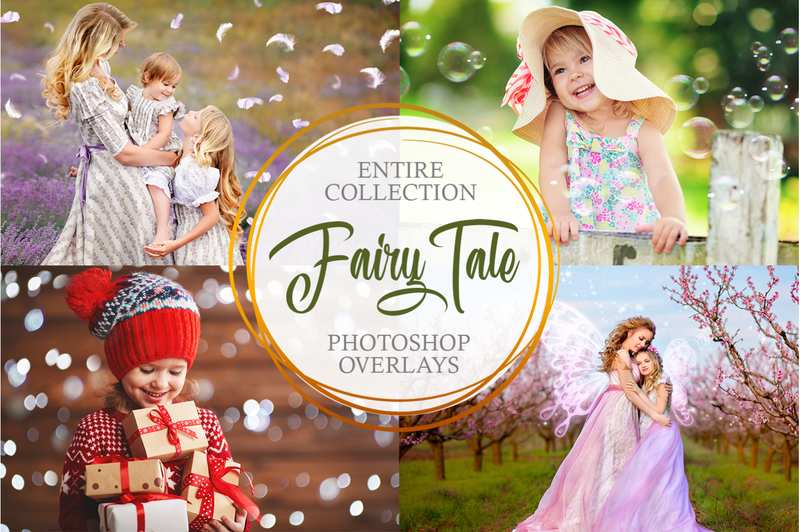 Each free butterfly overlay Photoshop from this bundle will make your portrait, toddler, and landscape images pop and transfer you to the fairytale. Such elements are perfect for lovely baby photographs or romantic couple pictures. Our butterfly overlay Photoshop free bundle is easy to download and use. You can check it right now. It is often difficult to photograph a butterfly so that the subject of your photography remains in focus, and sometimes it is unreal, especially if these butterflies do not exist in your area at all. However, sometimes we want them to be present in the frame of our shots. The butterflies add some kind of natural beauty, innocence, and romance. Now you do not need to worry about photo editing and adding the butterflies manually, our free butterfly overlays for Photoshop are easy to install and apply to your images. PS Overlay #1 "Magic Around"
PS Overlay #2 "In the Fairytale"
PS Overlay #3 "Free Flight"
PS Overlay #5 "Flying Butterflies"
PS Overlay #6 "Catch the Moment"
PS Overlay #7 "Small Miracles"
PS Overlay #8 "Playful Mood"
Our team of specialists always offer a quality product for busy photographers and photo retouchers. We are always trying to produce the useful things that are aimed to simplify or speed up the photo editing workflow. In addition to it, our products allow you to create something new, play with Photoshop effects and toolbar, changing settings and color gamut, and create your style using different effects, like the butterfly overlays for Photoshop. You can simplify your work, make your friends and relatives happy, and surprise your customers by using ready-made Photoshop overlays butterfly, which will fill the images with these cute and beautiful creatures. Our splendid butterfly overlays for Photoshop guarantee a magical transformation of the photo; they will revive your imagination with the fancy elements. On this page, you will find 10 free butterfly overlays for Photoshop to get amazing photographs. For convenience and simplicity, these files are represented in *. png format. You can work with the provided free butterfly overlays Photoshop in all versions of Photoshop, with 4, as well as in the Adobe Creative Cloud. Our free butterfly overlay for Photoshop is ready to download right here and now. The users can use our Photoshop butterfly overlay free set using any device from Mac or Windows. You can dive into the fairytale with any free butterfly overlay for Photoshop imposing them on the photos in JPEG or RAW format. Free Ps Butterfly Overlay #1 "Magic Around"
Be careful: this free butterfly overlay Photoshop is not compatible with Lightroom. This type of overlays will be suitable for any genre of the photography, even those which was taken indoors. This overlay #1 was taken from "Pearl Butterflies"
After applying the effect, small multicolored butterflies will fill in the right upper corner of the image. All butterfly images are clear, bright and realistic. Butterfly Photoshop Overlay #2 "In the Fairytale"
This version of Photoshop butterfly overlay free is ideal for children's and family portraits made outdoors. This overlay #2 was taken from "Pearl Butterflies"
How can you revive a dull frame without using art retouching? The answer is: the butterfly overlays Photoshop from FixThePhoto. As a result of using this overlay, you will get stylish original scenes with a very realistic look. Photoshop Butterfly Overlay #3 "Free Flight"
This option is ideal for images from a wedding ceremony. This overlay #3 was taken from "Pearl Butterflies"
With this butterfly overlay Photoshop free, you will turn your photo into an illustration from a children's fairy tale book. Along with the imposition of butterflies on the image, you can give the photos a style by changing the color scheme. Butterfly Overlay Photoshop #4 "Motion"
You can get stylish scenes with this Photoshop butterfly overlay free using outdoor photos and portraits made in spring and/or summer. This overlay #4 was taken from "Pearl Butterflies"
The proposed free butterfly overlay for Photoshop provides bright green butterflies that are located at the top of the picture. Most of the images of butterflies are indistinct, which creates an effect of lightness. Butterfly Overlay Ps Free #5 "Flying Butterflies"
This version of free butterfly overlay Photoshop will help create a dreamy style for small photo sessions. This overlay #5 was taken from "Pearl Butterflies"
A large number of medium-sized bright multicolored butterflies will create a certain frame around the main subject of the photography, thereby placing an accent on it. Free Butterfly Overlay Photoshop #6 "Catch the Moment"
It can be applied to sunny photographs. In extreme cases, use an eraser to hide unwanted elements. This overlay #6 was taken from "Pearl Butterflies"
The main butterfly color of this butterfly overlay Photoshop free is yellow. They are densely placed around the perimeter of the picture. Butterfly Overlay for Photoshop #7 "Small Miracles"
To make changes to the overlays, you will need a basic knowledge of Adobe Photoshop (or any other photo editing software). It can be applied to different photos, for example, the portraits or macro photography. This overlay #7 was taken from "Pearl Butterflies"
Butterflies on this free butterfly overlay for Photoshop are placed in a circle, thus leaving a place in the center of the picture. On this filter the butterfly color is orange. Free Butterfly Ps Overlay #8 "Playfull Mood"
Choose the photos taken in the warm season. Put accents with this overlay on the advertising photography. This overlay #8 was taken from "Pearl Butterflies"
On this butterfly overlay Photoshop free, as on the previous one, you will see beautiful butterflies in orange color, they look like the fallen yellow autumn leaves. They are large and arranged throughout the photograph. Ps Butterfly Overlay Free #9 "Relax"
This version of Photoshop overlays butterfly is ideal for nature, landscape photos. This overlay #9 was taken from "Pearl Butterflies"
Beautiful little blue and purple butterflies will create a round frame in the center of the picture. Not all butterflies are clearly depicted. Photoshop Overlay Butterfly #10 "Multicolored"
It is not recommended to use for black and white pictures. Apply to the pop photos which were taken outdoors on the sun. This overlay #10 was taken from "Pearl Butterflies"
This kind of Photoshop butterfly overlay free is aimed at giving explosive colors to the image. It will help show the most unusual side you have. So that you do not have trouble with time-consuming adding butterflies to Photoshop, and are satisfied with the results obtained after using Photoshop butterfly overlays, our designers offer downloading this set of free butterfly overlays Photoshop that are good for any genre of photography, creating a thematic style of the image. 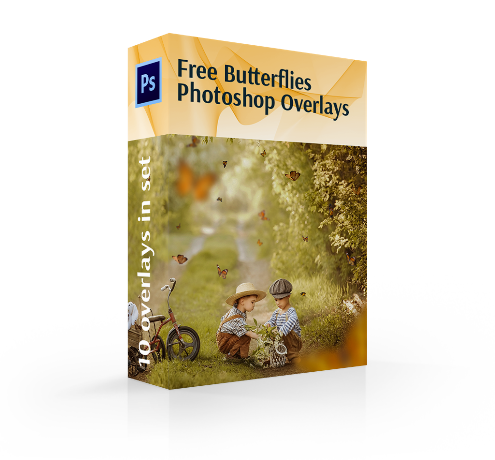 Do not hesitate, start dreaming and live up your ideas with our free butterfly overlays for Photoshop. With the presented 10 butterfly overlays for Photoshop in this set, you can safely experiment with the color gamut of the image, imposing your favorite effects with butterflies. All settings of the Photoshop overlays butterfly set range from blue and purple to yellow, green and orange.